Statistical Skier : Signs Of Kazahk Greatness To Come? Signs Of Kazahk Greatness To Come? I’m continuing to pick and choose which nations in Fasterskier’s countdown to write about. The US and Canada I’ll cover later in more detail, and I’m written about Japan a fair bit in the past. 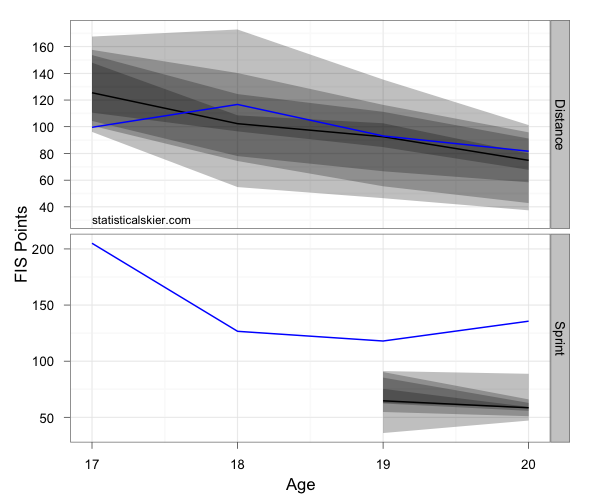 While that seems to suggest a smooth transition, keep the x axis scales in mind. There’s a 3 year gap there. 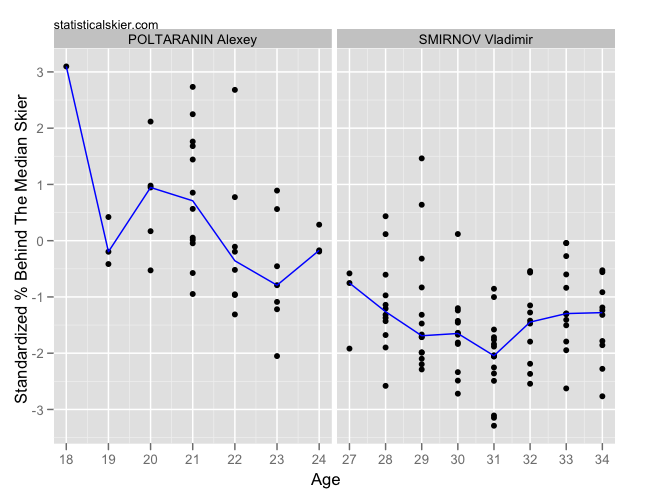 Also, be careful about trends at the end points, since age can be split across two different seasons, as in Poltaranin’s case. One little exercise for you is this: carefully cover up Poltaranin’s one excellent race from last year (his best). How much is that one point influencing the visual impression of a steady improvement? The other skier mentioned that caught my eye was Anastasia Slonova, who’s had some strong results as a junior. Although, I only have 29 FIS races on record for her including both sprint and distance events. She hasn’t had any stellar results yet in the handful of WC’s that she’s done, topping out at around 40th or so. But she is still quite young. So her distance FIS points are right in the middle of where you want to be if you’re aiming for WC success. Posted by Joran on Wednesday, November 9, 2011, at 6:00 am. Filed under Analysis, Cross Country. Tagged alexey poltaranin, anastasia slonova, kazahkstan, season preview, World Cup. Follow any responses to this post with its comments RSS feed. You can post a comment or trackback from your blog.